Gunjan Sinha took this photo of the aurora from Saskatchewan, Canada. Skywatchersaround the world's Northern Hemisphere, who were treated to spectacular auroraslast week, could get lucky again Monday night or Tuesday night, the result ofanother major solar flare over the weekend. Thoughit was not pointed straight at Earth, Saturday's eruption of charged particlesfrom the sun's surface was even stronger than the Aug.1 solar flare, which was assigned to C-class status based on the brightnessof its X-ray emissions. The flare could boost the northern lights displays thisweek for skywatchers at northern latitudes. Thelatest flare has been given M-class status, the second most-intense category (afterX-class). M-class flares are capable of causing radio interference around theEarth's poles. Eventhough the Aug. 1 eruption wasn't powerful enough to have many noticeableeffects on Earth, it caused a show of colors that satisfied those northernerswho kept an eye on the night sky. Solorflares, or coronal mass ejections, are eruptions of plasma and ionized atomsinto space. As these atoms reach Earth, solar particles stream down theplanet's magnetic field lines toward the poles. Inthe process, the charged particles collide with atoms of nitrogen and oxygen inthe atmosphere, creating impressive aurora light shows in the process. 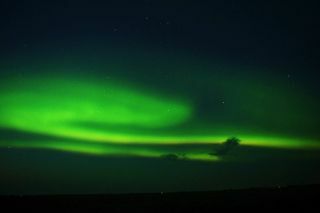 "Theactual experience itself was terrific," said Colin Chatfield, also ofSaskatchewan, who snapped photos of the auroras. "It was a wonderful showthe other night, and I'm glad that it wasn't clouded over like has been thecase for much of the night-sky events this year." DerekWeston, an avid aurora observer, was vacationing in St. Germain, Wis., when hecaught the northern lights. "Lookingnorth, I could see what appeared to be a faint band of brightness on thehorizon," Weston told SPACE.com, but after about an hour and a half, hesaid, "things really picked up. Now the green glow to the north had grownvertically, and on top of that vertical development we had rays going -? thoseare the pinks and purples you see." Anextreme ultraviolent photo released by NASA's Solar Dynamics Observatory showed thesun in mid-eruption. SDO, which was launched in February, captureshigh-definition views of the sun at a variety of wavelengths. Theinteraction of the solar particles with Earth's magnetic field has thepotential to create geomagnetic storms, or disturbances in the planet'smagnetosphere. The Aug. 1 flare created a strong geomagnetic storm that lastednearly 12 hours, NASA officials said in a statement. Intensesolar storms are capable of causing disturbances to space-based assets such assatellites, as well as to electronic infrastructure on Earth.? Thesun's activityusually ebbs and flows on a fairly predictable cycle. Typically, a cycle lastsabout 11 years, taking roughly 5.5 years to move from a solar minimum, a periodof time when there are few sunspots, to peak at the solar maximum, during whichsunspot activity is amplified. Thelast solar maximum occurred in 2001. The latest minimum was particularly weakand long- lasting. The most recent solar eruption is one of the first signsthat the sun is ramping up activity and heading toward another maximum.